A small Alla Prima piece by the artist with an immediate and confident rendering showing the essential colours of Blue and Brown that make this country so special. 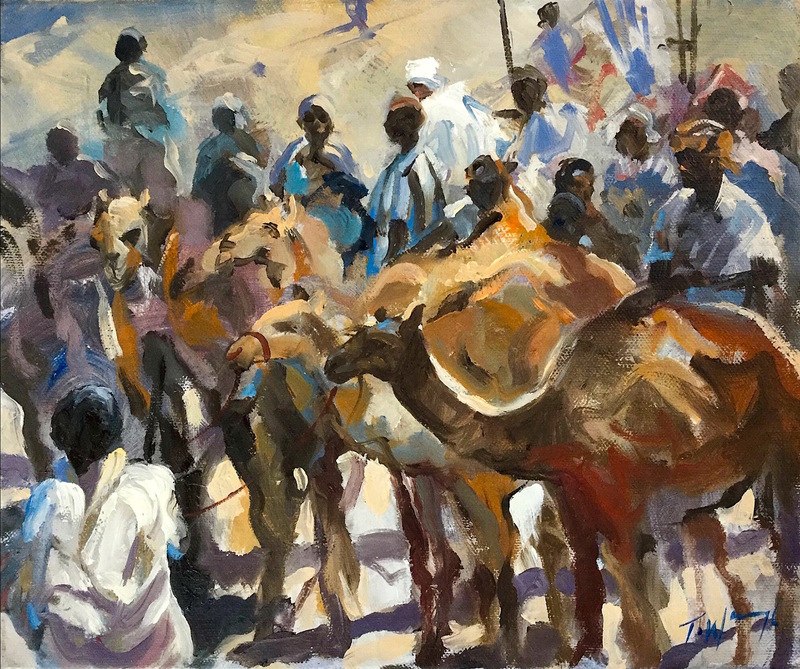 There is just enough detail in this work to convey the excitement of a camel bartering market. A simple scene brought to life with swirling brushstrokes. ” I wanted to convey the life and excitement of being at a camel market, with all its noises and smells, contrasts and lively conversation.” Young camels are put up for auction or trade in these markets and fortunes can be won or lost on a handshake. There is a sense of urgency in the brushstrokes on this canvas and the feeling of being there, or part of it. This is a looser work and contains an authenticity only achieved when a painting is of an immediate concern to the artist ; the need to express with speed what is being experienced in the moment.